An Online, Nationwide Initiative to re-sign Historic Route 66. This article was written by Rod Harsh, Director and Founder of the Route 66 Chamber of Commerce, and other Route 66 websites designed to promote historic Route 66 tourism. Rod has a strong background in the Tourism industry. While living in Florida, he produced Tourist TV and RV USA TV which aired online and daily on area cable systems. He also worked closely with the Tourist Development Council and the Northwest Florida Production Services Association, maintained Media Credentials and produced Hurricane documentaries. Born in Joplin, MO., Ron returned to his hometown of Joplin Missouri in 2006 and opened the first Route 66 Visitors Welcome Center in the western half of Missouri and now operates the Route 66 Chamber of Commerce. The purpose of this site is to restore the identity of this most famous of American highways using the placement of directional signage that will help guide the travelers of today, while encouraging future generations the opportunity to discover the values that built America's Main Street, Route 66. When Route 66 was decommissioned in 1985, the old highway was not crated-up and carried off (although a forty-foot section in Oklahoma was sent to the Smithsonian Museum). With the stroke of the pen, it simply lost it's official U.S. identity and it was then be renamed, re-designated, re-numbered and re-signed by the eight states in many different ways, ...enough so it would not be recognized by future generations for what it originally was, so history was being re-written and the Mother Road was fast becoming the "Forgotten" road. For the past 36 years, highway historians and dedicated Route 66 "Roadies" alike have rallied to revive and re-store this famous highway without much support from state and local governments, and in spite of this "out-of-sight, out-of-mind" mentality, we have proven that Route 66 has come back strong. So much so that a rice farmer in China may likely recognize the Route 66 shield today. The Route has become a symbol of the "Real America" to the rest of the world. The people along the Route are like characters from Mayberry, friendly and considerate and possessing grass-root values that seem to be missing elsewhere. It is this spirit that attracts thousands of domestic and international visitors every year. Naturally, the hard-core "Roadies" may not need signs, but most others do...especially those first-timers from overseas who have a difficult time reading maps and guide books that are printed in English, and unfortunately, many maps and books contain errors and mis-information,...sometimes leaving-out whole Route 66 communities! It is safe to say that a majority of Route 66 travelers want to see the original, "Historic" 1926 Route, and possibly the alternates that followed in later years, but still today, many are missing their goal. Directional signage with the Route 66 shield virtually eliminates this problem. Then there are the American travelers, many "checking-out" the Route for the first time. They quickly learn that a good guide book is essential, but signage would also aid and encourage them to explore more of the communities that have much to offer. Most visitors simply don't have the luxury to find the Route the hard way. Being lost, then finding your way, works well only for sinners, not for Route 66 travelers, who find that their journey is taking longer than expected. Many have a schedule to maintain and a plane to catch at the end of the line. Some community leaders still believe that "lost" tourists are a good thing, because they may see more of their town. In fact, for a Route traveler, getting lost is frustrating and time-wasting, so instead of stopping they move on....making up for "lost" time. This problem will be passed along to their friends, who may choose NOT to travel the Route in some areas, fearing that they too will lose their way, and Route businesses will suffer a little more. Naturally, there is a first step, and it starts in each Route 66 community. If signage is needed, call (or write) your Mayor, City Manager and/or the Route 66 Chamber of Commerce and explain your concerns. Have them visit the Chamber's web site and contact their nearest Visitors Center (or tourism office) to see if a lack of directional signage is a continuing problem for Route 66 travelers. Ask if they would also consider "stenciled" signs on the streets as well. The question is "What if they do nothing? I had a directional sign made by a professional sign company to use during presentations to local government and civic club meetings. The custom-made sign cost me $25., and would have cost less if purchased in quantity. The sign made is a standard, highway-grade aluminum product with a vinyl overlay. It is not reflective as few people drive the route at night. The price does not include a post, mounting brackets or labor to install. In some locations, a larger sign may be required to increase visibility. We consider the sign to be a "temporary" aid to travelers, until better signage comes along. 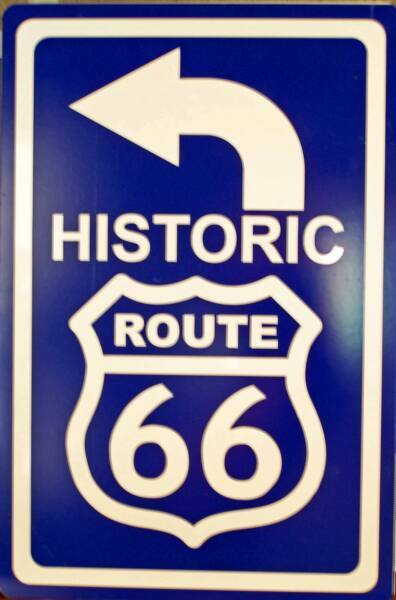 If the city, county and state politicians, CVB's and Chambers of Commerce fail to recognize the importance of "Heritage Tourism" and the economic benefits that follow, then obtain the permission of the numerous Route 66 businesses (near unmarked turns in your town and county) to have signs placed on their property, (IE. their building, existing sign etc.). One idea is to have the businesses (or sponsors) pay for the sign and any hardware to mount it. They will then own that sign, and if and when better signage is provided, they may donate the sign for use elsewhere. You may personally install the sign yourself if needed. Our website features a "Sign Sponsor" page, listing those who have made this contribution and a photo of the installed sign. I also will post video of this grassroots sign program on YouTube in the future, hopefully attracting more sponsors and perhaps national media attention. We should not have to beg for signs to help others traverse this famous highway.....after all, Route 66 is the most famous highway in the world ! It was immortalized in the John Steinback novel, "The Grapes of Wrath", and later dedicated as "The Will Rogers Memorial Highway". It was the star of the 60's TV series "Route 66", and Bobby Troop's 1946 song "Route 66" has been recorded by more groups than any other song in history! Movie stars, average Americans, young soldiers heading off to war and the less fortunate were searching for a new life as they traveled on Route 66. In 1990, the Federal Government passed the Route 66 Study Act, recognizing that Route 66 "has become a symbol of the American people's heritage of travel and their legacy of seeking a better life". Route 66 has been recently listed on the World Monument's Fund 2008 Watch List of the 100 Most Endangered Sites, and a week later, The National Trust for Historic Preservation collectively named Route 66 motels to it's 20th. annual list of the 11 Most Endangered Historic Places in the U.S.. Today, some sections of the famous highway have also been listed on the National Register of Historic Places, and more will follow. It should be obvious...Route 66 was the road we took to reach the American Dream, yet it's businesses continue to struggle to this day because those who are looking for them get lost or mis-directed, and pass them by. They still lay out the welcome mat every day, just as past generations did decades ago. Despite the Great Depression, World War II, Korea, Vietnam, recessions, gas shortages and later high gas prices...they have been there every day for over 80 years. They remain Route 66 survivors and preservers of America's history, and when they ask for a few token signs and some respect from their elected leaders, then they are most worthy..... and the Old Road is most deserving. Let's tell our state and community leaders that by ignoring the signing of this famous road is akin to neglecting our heritage while playing a cruel joke on those who do travel on it. 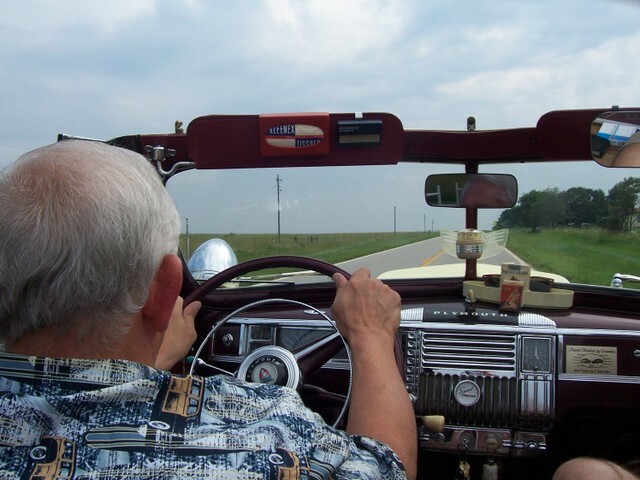 Tell the story of Route 66 to anyone who will listen. Our voices are the best tools to use to preserve Route 66. Route 66 is still there. It will live on until the last chunk of asphalt and concrete is lost to the ages, and until the last person on earth forgets about it.